Why the Catholic Church Considers Jesus Christ to be God? Is it True that the Catholic Church Believes in Three Gods instead of One? Is it True that Christians Have Made Changes into the Holy Scripture? Is it True that Christians Worship their Saints? Is it True that Christians Worship Icons and Statues? Why Catholics Consider the Pope to Be a Deputy (Vicar) of God on Earth? Whether Crusades are Contrary to Christian Doctrine? How Inquisition Acts Conform to Christian Doctrine? Is it True that Homosexuals are Married in the Catholic Church? In order to understand the answer to this question first of all an asking person must find out which sources the Catholic Church is guided by when she endows Jesus Christ with one or another feature or ascribes a statement to Him. The Catholic Church has two principal sources of her teaching. They are the Holy Scripture and the Holy Tradition. If we want to know what the Roman Catholic Church speaks about one or another dogma of her Magisterium, then we are sure to use the above-mentioned sources. The Holy Scripture is a collection of books in which the information of the Divine Revelation was collected and kept over a long period of time. The Holy Tradition is the information of this Revelation; this information has also been kept by the Church for ages. The question raised is not fresh for the Church as it has been asked by many people. Of course, this question is very important. Even once Jesus Christ Himself asked it to His disciples. He said to the Apostles, “But who do you say that I am?” (Mt. 16:15) The Holy Scripture gives us the answer having single meaning to this question. Peter says, “You are the Christ, the Son of the living God” (Mt 16:16) In the New Testament Jesus constantly gives the people gathering round Him to understand Who He is indeed. He frankly endows Himself with various features, properties, and attributes which only God can possess. For instance, He says to Israelites about His eternal existence. “Jesus said to them, “Truly, truly, I say to you, before Abraham was born, I am”, (John 8:58). He also says that He has the right to alsolve sins to people, and Israelites filled with indignation blame Him for blasphemy. Were Jesus Christ not God, they would have been right because only God can absolve sins. 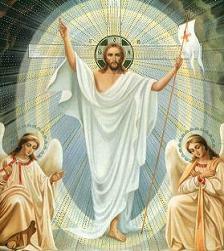 Jesus holds sway over life and death, over forces of nature, animals, and also over Satan`s demons. Finally, He repeatedly speaks about Himself as about God; He speaks about His eternal being in the same words that God confided to Moses (“before Abraham was born, I am.”). When one of His disciples asks Him to show God to them, He points at Himself. “Have I been so long with you, and (yet) you have not come to know Me, Philip?” Jesus takes worship of Thomas, who names Him God. Could Jesus have said such words if He were an ordinary prophet? Then they would really have been blasphemous. Thus, the Catholic faith in Jesus Christ`s Divinity is based on His own words. The Holy Tradition only confirms that just the faith which Jesus Christ`s apostles delivered to the world has been acknowledged since the very beginning of Christianity. The Church acknowledges the faith in One True God, Who showed Himself to people in three hypostases: in the Father, in the Son, and in the Holy Spirit. First of all, this faith as well as the faith in Jesus Christ’s Divine Nature is founded on the sources of the Divine Revelation: the Holy Scripture and the Holy Tradition. We draw all the information of God from these sources through which He Himself wished to confide to the world. How can it be? In what way is it possible for one God to be the Father, the Son, and the Holy Spirit at the same time? In other words, how can one plus one plus one make one? When we speak about things that are usual to us, do not resist our logic, understanding, we have the right to be surprised and even indignant if we are told anything like that. But every time we ask such a question about God, a priori we imply that we can understand Him, Who has created the Universe, stars, the Earth, and us ourselves. Allegedly He is so plain that it is easy for us to describe His inward life, thoughts, and intentions and so on, as if we describe a creature like us. Is it reasonable for a man to ask the question to God, “Why can You be such as You are?” If we ask this question, then we mean that we know quite exactly what God must be like. Then how do we happen to know about it? Unfortunately, many people think that their ideas are more correct than those which we can get from the Holy Scripture. Christians prefer to seek the answer to this question in God’s Word that He Himself delivered to the world through His prophets and apostles. 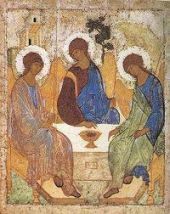 Following the Divine Revelation, the Holy Church teaches, “Our general Christian faith is that we worship one God of Three Persons and Three Persons in the unity of the Godhead, we not mixing up these Persons and not breaking off the Divine Nature. 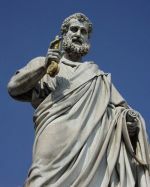 Before his being converted to Christianity, St. Augustine was a pagan philosopher. Despite considering the Christian doctrine to be true, nevertheless he could not understand the essence of the Trinitarian Dogma. He spent a lot of time on thinking about it. That idea would not let him have a minute`s peace. One day St. Augustine was walking along the shore of the sea. He was absorbed in his thoughts about God`s Nature trying to reconcile Him to his mind. While going for a walk, he saw a boy playing on the shore. The boy had dug a small hole and was carrying water into it with a cockle-shell. In order to distract himself from his distressing thoughts, Augustine came up to him and asked, “What are you doing, kiddy? What kind of play is it? “I want to pour the water from the sea into my small hole”, answered the boy. “Silly little thing, burst out laughing Augustine, don`t you see how enormous the sea is! Is it possible for it to be in this small hole?” “In what way do you want to get the endless God into your little human mind?” the boy asked and disappeared. The opinion of the unauthenticity of the Holy Scripture is a favourite subject of many opponents of Christianity. The legend of some “original” scriptures, which were deliberately wiped out by Christian Church leaders, is pressingly kept up in the mind of people, who have a little knowledge of real historical facts. Every man interested in the truth can easily make sure of the unfoundedness of these charges. Christianity started its triumphal journey all over the world from Jerusalem, where the Church came into being at Pentecost, the first one after Christ`s Resurrection. The new faith was disseminated all over the Roman Empire for several tens of years. In many cities arose the first Church communities. During their devine services Christians used different holy texts, most of which are part of the Canon of the Holy Scripture at present. As there were no printing-presses then, books were handwritten and held in big communities, just as Israelites kept scrolls of the Pentateuch in their synagogues. The dissemination of the New Testament increased to enormous proportions. No ancient literary monument was kept in such a large number. At present there are over 5300 items of the New Testaments in Greek, more than 10,000 items of the New Testament in Latin (Vulgate), and at least 9300 more early manuscripts. Thus, the total number of existing copies exceeds 24,000. In comparison with them, the famous “Iliad” by Homer has been kept only in number of 643 copies. In order to make essential changes into the Holy Scripture it would have been necessary to change all the manuscripts on the whole territory of the Roman Empire. It is obvious that no one would have succeeded in changing all those texts quickly, smoothly, and without leaving a trace since changes would have had to be made into tens of thousands of books kept by communities. And so no one can say that the Bible has changed so considerably that it can be given no credence to. This allegation would not correspond to the facts. Unfortunately, most people, who spread this information of the Holy Scripture, do not give themselves trouble to verify its truth. Sometimes the question of distorting the original text of the Canonical Scripture is raised in another form. It is well known that besides the Apostles` Epistles and the New Testament lots of the so-called apocrypha were written in the first ages of A. D. Apocrypha are books having a claim on being the Holy Scripture. The Church turned them down for some reasons or other. Dishonest propagandists exaggerate the importance of these books very often, contending that Jesus Christ’s true Revelation has been concealed on their pages. They profit by lack of information and trustfulness of the people to whom these allegations are addressed. Apocrypha are not “secret knowledge” thoroughly dissembled by the Church; most of them are within reach. And what is more, it can easily be retraced the history of their origin, using proper books. Many apocrypha are of considerable interest to studying the life of early- Christian communities or heretical doctrines; they are not a sealed secret to us. The question of the authenticity of the Christian Scripture is a historical one first of all. In the presence of up-to-date means of information every unprejudiced person can easily verify one or another allegation pretending to real historicity. But besides historical facts, Christians trust God; He is certain to be able to see His Word reached an addressee`s ears without any perversions. No, it is not true. Christians only worship the Lord; no one can take His place. Honours done to people who have passed away, but they have shown their faith in Christ with their holy and pious life are not worship in the same sense as we refer to God. The first commandment warns believers against superseding God for someone else, but it does not run counter to the fourth commandment, which insists on honouring parents. Somebody can hardly say the proper respect for parents is at variance with worshiping one God. We honour our parents because they gave birth to us, reared, and brought us up, but we also honour Saints for their setting an example which we can follow. Perhaps, somebody will say, “But you also pray to your Saints and Martyrs, don’t you? Is it not the breach of monotheism commandment?” Yes, really, there are some prayers made to the Virgin Mary, the Apostles, and other Saints in the Christian Catholic tradition. However, they are quite different from those that we make to the Lord. We believe Jesus Christ’s Church to be a large human family involving people who have become God’s children thanks to Christ. When some of the family became Saints and reunite with the Lord in heaven, they only came closer to their Father, remaining our brethren though we are still travelling about the Earth pending the Heavenly Kingdom. If we make a request for a prayer to our brethren, who are as sinful as we ourselves living on the Earth, then all the more, we can make the same request to those who have already reached the City which is above and see the Lord face to face. Thus, prayers to Saints are only requests for a prayer together with us. Saints do not answer our prayers; they only pray to the Lord near us. They are much closer to Him and do not need prayers for themselves. No, it is not true. 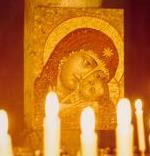 The same way as in respect of Saints, the Church does not teach believers to worship icons, but she only teaches to honour them. She says that honouring or worship (depending on who is painted in an icon) goes back from the image to the prototype, i. e. to a Saint really being (existing) in the Eternity or to Jesus Christ Himself. Amidst antagonists of this Church practice there is an opinion that honouring of icons arose on the basis of the pagan custom to image gods in the form of statues and drawings. Allegedly, the first Christians, who had been pagans before, could not diverge from their idolatry, and so there arose icons in the Church. Both Mussulmen and different Christian communities and sects rising in opposition to icons share this opinion. Of course, this opinion is popular, but it is baseless. The small excursus to the history of the first seven Oecumenical Councils will permit anybody, who doubts, to make sure of that. The dogma of icon honouring is the logical end of the centuries-old argument between orthodox believers and various heresies about Jesus Christ`s nature. It is interesting that Protestants hotly coming out against any pictures in a divine service do not often ponder over reasons for this prohibition. In the Old Testament the Lord strictly forbade people to paint Him and worship these pictures. “So watch yourself carefully since you did not see any form on the day the Lord spoke to you at Horeb from the midst of the fire”, said God to the Hebrews. Hence it follows the prohibition to paint God. Nobody had ever seen Him, and no pictures could have shown Hebrews all His Grandeur and Holiness, but only they would have led them astray since around there were many pagan peoples worshiping idols. One can be surprised at honouring some specific icons, which are considered to be wonder-working. However, it is not idolatry. If God desired acting through an icon, then afterwards its particular honouring has nothing to do with that icon, but only with God working wonders amongst people. Besides, in believers`life icons find a practical use for concentrating on necessary thoughts not being digressed from them. A question like that is often asked both by people who have nothing to do with Christianity and by Christians who do not belong to the Catholic Church. It is astonishing that the people asking this question are very much surprised at the title of the Roman pontiff: the Deputy of Jesus Christ on Earth (just so it sounds; the expression “the deputy (vicar) of God is never used). It seems to them that it is desplay of exorbitant pride of Roman bishops and nearly blasphemy. However, in this title there is nothing that can be contrary to the Christian doctrine and to common sense. Who is called a deputy (vicar)? It is manifest that a deputy is a man to whom his chief has entrusted part of his power (for a while or on a certain territory). For instance, at the age of colonialism many colonies of European states in different parts of the world were ruled by viceroys. At present in many countries there is a post of vice-president acting for president in a certain situation, and someone can scarcely think seriously that viceroy can have a claim on king`s power. On the contrary, he exists in official hierarchy only because his master entrusted him with representing king`s power on a dependent territory. After all, who has entrusted bishops of Rome to represent Jesus Christ in the Church and on Earth? The answer is manifest: only Jesus Christ Himself could do it. Whenever did that happen? The Holy Scripture contains the narrative of that. In the New Testament Christ particulary marks out one of His twelve disciples several times. He gives him a new name. This name is deeply symbolic. That disciple always speaks on behalf of the other Apostles, besides, he is the first man to accept Christ as Messiah, Son of God. After that, Christ promises to found His Church on the rock which he names Simon-Peter and gives him the keys to His Church. Finally, after His resurrection from the dead Jesus entrusts Peter to pasture His flock, His Church on Earth, remaining her everlasting shepherd. Thus, making Peter His deputy (vicar) on Earth, thereby the Lord Jesus Christ has shown that the Church needs a shepherd and as before his martyr death Peter was bishop of Rome, just that Episcopal pulpit inherits power given to the first Apostle by Jesus Christ. Since then all the Popes have had the very power in the Church that Christ entrusted Peter then. The expression “Crusade” is very popular with people who consider themselves to be completely aware of this terrible Christianity, which, in their opinion, served as a reason for many wars, distresses and strong bloodshed. Opponents of Christianity and the Church can scarcely miss the opportunity to remind of the Crusades every time they want to represent our faith in unfavourable light. 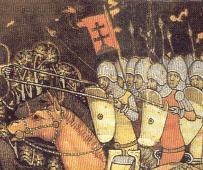 There are a few known errors about the Crusades, which are considered to be absolute truth proved by historical facts. For example, the Soviet Historical Science, which was sooner an ideological instrument of class struggle than an upholder of historic justice, devoted itself to spreading these errors. Let`s consider the best-known of them. It is common knowledge that the Crusades were aggressive wars provoked by the Church power, which was greedy for money. However, this affirmation is at variance with historical facts. First of all, the Crusades were defensive wars. The Christian world did not attack; Christians were obliged to defend themselves. At present not many people keep in mind that Palestine, Syria, Egypt and the territory of present- day Turkey were part of the enormous Christian world. The whole Christian East was captured by Moslems, and they did not have the intention to stop. Jerusalem was then the heart of the Christian world, the city where its greatest sacred places including the main one, the Holy Sepulchre, the city found itself in invaders`s hands. Pilgrims who came back from the Holy Land told in tears about humilation and offences that they had to suffer. In the eighth century, Moors captured North Africa and Spain; in the ninth century the Byzantine Empire was on the point of collapse because of Seljuk Turks. Thus, the declaration of the Crusades was proclaimed to protect the Christian West. It is often said that knight crusaders starting for the distant eastern lands were attracted by the thirst for easy money. In this way they supposedly wanted to increase their fortunes of modest means. Of course, it would naively be considered that among the knights there were no people who pursued ignoble aims at all. According to the results of unbiassed historical research, a crusade was often an unprofitable, sometimes even a ruinous venture since many of its participants were prosperous feudal lords possessing castles, lands and considerable fortunes. That they left their estates and went to the battle field as ordinary warriors is the illustration of their good intentions. We do not set ourselves as an object to prove the complete innocence of crusaders. Unfortunately, their actions were not always dictated by the sincere Christian faith and the love for eastern brethren suffering from aggression. There are many black pages in the Crusade History, but to imagine the Crusades as a mercenary gamble (shady enterprise) is not right either. First of all, their primary task was the defence of brethren to come to grief, and that was a deed pleasing to God. Anyway, that Europe could keep Christian values for future generations and become the best-developed and mightiest civilization is the crusaders` greatest service. If anyone made up their mind to check the very “generally known historical facts,” he would be very much surprized at grossly overstating the cruelty and blood-thirstiness of the Inquisition. James Hitchcock, a professor of Saint Luis University, quite correctly said that in our time, when there is a lot of easily understood information, its great number does not guarantee its influence upon public consciousness. People prefer to use habitual cliches, easily believe in what they get to know from the Press, fiction, movies and so on. It is quite natural as a serious historical research is a very labour- intensive process, and cliches, stereotypes are easily understood. The word “inquisition” means “investigation” in Latin. This institution was established just with the purpose of investigation of various accusations brought against people by temporal and Church powers. It is necessary to take into account of the fact that in the 18th century up to the beginning of the socalled Age of the Enlightenment was not the principle of church and state separation. Temporal powers punished for the crimes commited against the Church the same way as for all other crimes. For example, people were commited to the flames on a charge of witchcraft. It is clear that evidences of these accusations were often forced and absurd, in particular if one takes into account that inquiries were held by temporal powers who were not experienced in scholasticism. For instance, supposing that a man put his clothes on inside out, and after it a storm passed over the man`s village and destroyed crops. The authorities already had every reason to find this man guilty of the natural calamity. Just so the Church established the Holy Inquisition, a special Church institution investigating accusations like this. All the inquisitors were professional jurists. They held inquiries on the basis of the Roman law. Undoubtedly, torments and death sentences took place, but they were not so many as publicists of popular editions write. As the Inquisition investigated cases bound up with the accusation of heresy, just public penance and not a fire was a wide spread kind of punishment. Only some cases finished with this severe sentence. However, it should be observed that inquisitors only passed the results of investigation to the authorities; the authorities already decided the matter of punishment. Thus, the number of inquisition victims has grossly been exaggerated. In his sensational novel “The Da Vinci Code” the writer Dan Brown tells a terrifying story about more than five million expectant mothers executed by the Inquisition. Commenting upon it the well-known orthodox publicist, Deacon Andrey Kurayev ironically asks in what way Europeans could have populated all the continents of our planet if inquisitors had executed so many women. No, it is an absolute lie! And what is more, he who insists on that openly calumniates the Catholic Church since she has always enunciated (proclaimed) the Gospel truth of the immaculacy and holiness of matrimony as a man and woman`s union instituted by the Lord, and the Church has always regarded homosexuality as a terrible sin. The Lord already tells people about the matrimonial institution on the first pages of the Holy Scripture, and then He shows the abomination of sexual perversions of all sorts in the Law given to Moses. Homosexuals` matrimony is great sacrilege, profanation of the Holy Marriage Sacrament. And so today in our secularized society just the Catholic Church upholds the position of traditional family and real matrimonial relationship.